If you are looking to turn your laptop into desktop workstations with one single USB 2.0 cable, driving monitors up to 2048 x 1152 pixels, you must be out of your freaking mind. Or maybe you just need these. 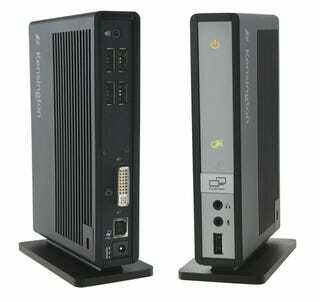 They are two new Kesington Universal Notebook Docking Stations, both powered by the DisplayLink DL-195USB graphics processor. That means that your notebook graphic card would not be used. The DL-195USB will process all the graphics and send it to your monitor, so your build-in fancy GPU will sit idling and whistling.